In the lead up to Cup Match in 2009, Jamie Ramsay sold air horns on the side of the road in the sweltering heat, but this year he may move more than 10,000 Cup Match-branded items without breaking a sweat thanks to a network of seven retail outlets including Gorham’s, Makin Waves and People’s Pharmacy. His quickly expanded enterprise is in lockstep with an undeniable monetization of Cup Match over the past decade that has mobilized entrepreneurs and marketing professionals who see the excitement of Cup Match as a true branding opportunity. “Bermuda isn’t very good at fan-based products and I’m trying to build on that,” said Mr Ramsay, 32, who works in IT but declares his “true passion is marketing”. Cup Match-branded bottle openers, koozies, car shades, banners and lapel pins are just a sampling of what’s on the menu for fans this year from Mr Ramsay’s side job company called Bermuda Glow. And he sees even more potential for growth. “I’m trying to build on items post-Cup Match so when the champion is decided there are Cup Match champion items ready to go. That’s the way it should be,” he said. Since 2006, HSBC has seen the same opportunity in Cup Match as the upstart entrepreneur. 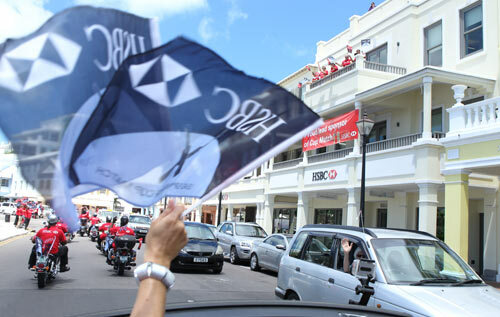 HSBC’s marketing team plans multiple days of events for customers with free snow cones, cookies and car flags in team colours. From the outside looking in, it’s like an exuberant celebration, but internally it’s very much fuelled by business strategy. “The feedback from the community and our customers is fantastic,” said a bank spokesperson on behalf of CEO Richard Moseley. “They really enjoy the interaction with our staff, including senior management, who serve the snow cones in the branches. HSBC also works directly with the cricket clubs on a sponsorship deal and further sponsors live broadcast coverage of the cricket classic on television, radio and at bermudaCupMatch.com. It’s an effort that doesn’t come cheap. The web component was added to the overall media mix in 2010, an offshoot of bermuda.com (sister company to Bermuda Sun). Until then there was no centralized online portal that covered the sporting, cultural and recreational aspects of Cup Match, while also providing live streaming video around the world. The website is supported consistently with advertising dollars, allowing users to access the content and live video for free. Because Cup Match is the most-watched live sporting event on the Bermuda calendar, it’s tantamount to how Americans view the Super Bowl. That thinking must have crossed the minds of New York-Presbyterian Hospital officials, who will use Cup Match weekend to promote its facility overseas. In additional to buying airtime on the live Cup Match broadcast, NYP is also a bermudaCupMatch.com advertiser and sponsoring a football tournament at BeachFest. Cup Match celebrants only need to check their wallets to confirm Cup Match is as much about consumerism as it is about cultural heritage. And increasingly companies in and outside of Bermuda — from hospitals to street vendors — are using Cup Match to win a larger share of your spending.